A parliamentary report of 1777 recorded parish workhouses in operation at Frome Selwood (for up to 54 inmates), Berkley (60), Mells (80), Nunny (60), and Road (30). 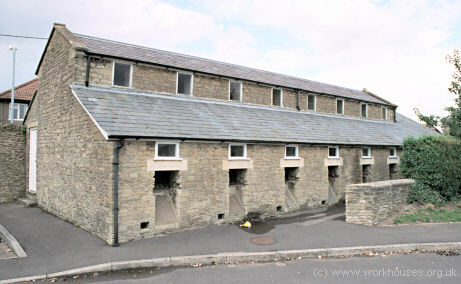 A building known as The Barracks on Church Street in Kilmersdon once served as the parish workhouse. 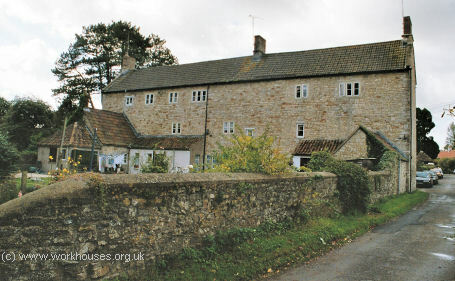 Kilmersdon former parish workhouse, 2004. County of Somerset: Beckington (2), Berkley, Buckland Dinham, Cloford, Elm, Farleigh Hungerford, Foxcote, Frome (5), Hardington, Hemington, Kilmersdon (2), Laverton, Leigh-upon-Mendip, Lullington, Marston Bigot, Mells (2), Norton St Philip, Nunney (2), Orchardleigh, Rodden, Road [Rode], Standerwick, Tellisford, Wanstrow, Whatley, Witham Friary, Woolverton, Writhlington. Later Additions: Babington (from 1845), Selwood (from 1894). The population falling within the Union at the 1831 census had been 26,236 with parishes ranging in size from from Hardington (population 28) to Frome itself (12,240). The average annual poor-rate expenditure for the period 1833-35 had been £16,789 or 12s.10d. per head of the population. 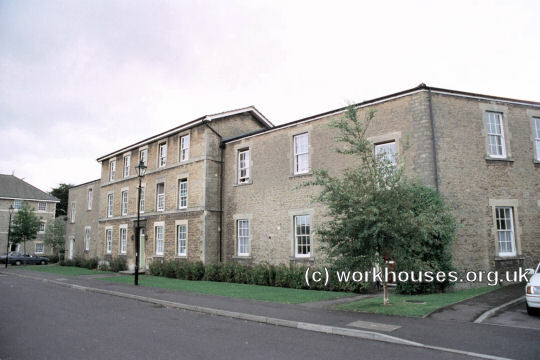 Frome Union workhouse was built in 1837-8 at a site on the south side of the Weymouth Road in Frome. The Poor Law Commissioners authorised an expenditure of £5,400 on construction of the building which was intended to accommodate 350. The architect was Sampson Kempthorne who designed many other Union workhouses including those at Bath, Bridgwater, Taunton, and Yeovil. Frome was based on Kempthorne's hexagonal or "Y" plan. The main building had an entrance and administration block at the east. To its rear was a central hub, from which radiated three accommodation ranges between which were created exercise yards for the various classes of inmates. Service and utility blocks, mostly single storey, formed the hexagonal perimeter of the workhouse. The site location and layout are shown on the 1903 map below. Frome site entrance from the north, 2000. 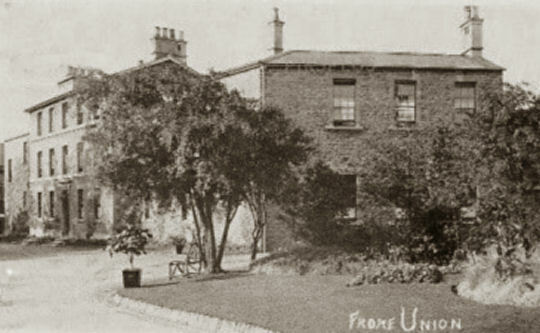 Frome entrance block from the north, early 1900s. 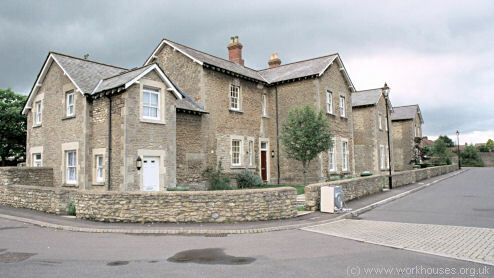 Frome entrance block from the north, 2000. Frome main block from the north-west, 2000. Subsequent additions to the site included an infirmary an infectious wards at the west, a school block at the south-east, and a lodge and casual ward at the site entrance to the north. 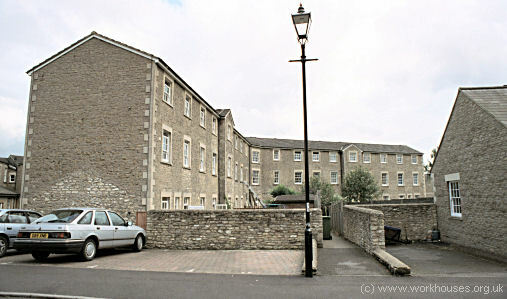 Frome infirmary block from the south east, 2000. 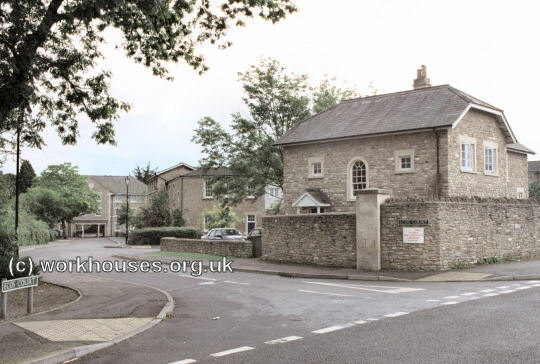 From 1904, to protect them from disadvantage in later life, the birth certificates for those born in the workhouse gave its address just as 29 Weymouth Road, Frome. The former workhouse later became Selwood Hospital which closed in around 1988. The site has now been redeveloped for housing. As well as the main building, the casuals' and infirmary blocks have been retained but the children's block no longer survives. In around 1913, the school block began to be referred to as the Whitewell Home and was used as separately managed children's home. In 1924, it could house 32 children and the superintendent was T. Titchener. Somerset Heritage Centre, Brunel Way, Langford Mead, Norton Fitzwarren, Taunton TA2 6SF. Holdings include: Guardians' minute books (1836-1930); Admissions and discharges (1847-1930, with gaps); Indoor relief lists (1849-75, 1878-1919); List of paupers (1889-1915); Births and deaths (1836-1914); Creed register (1910-1919); etc.